ability that they were both asked to perform bell tolling at Marquette, by the bishop. At the close of that year Rev. Joseph Zalokar took leave of his well liked parish and as a memoriter left an edifice in which many a toil worn hand and anguished soul bowed in prayer. 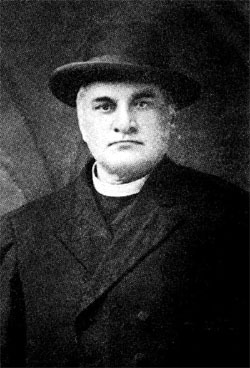 At the beginning of 1892 a new priest arrived, The Rev. Mark Pakiž. Increasing numbers of Croatians arrived too and became members of the church. The number of church trustees was increased to six, two of whom were Croatians. The membership of the church that year was 1260. 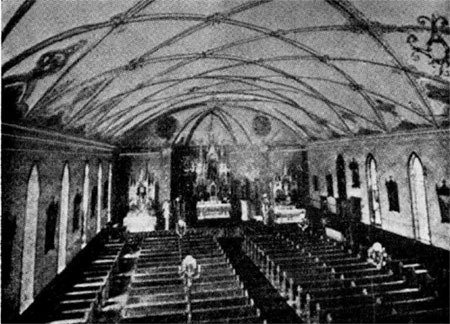 In 1897 the interior of the church was redecorated, which made it at that time most beautiful in the entire neighborhood. Would-be Americans arrived here daily in great numbers seeking employment. By now membership of the church became so large that the seating capacity was taxed to the utmost. 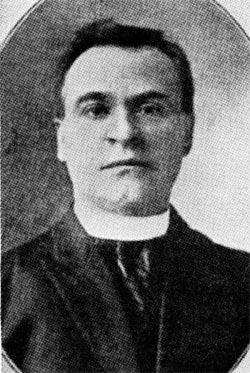 In 1901 Rev. Joseph Polič, a Croatian, came to assist the Rev. Pakiz, who, because of the demands made upon his services, needed additional help. The church originally thought to embrace all of the Slovenes, became in a few years much too small, so that the Croatians under Rev. Polič organized a parish and began building their own church. Meanwhile the Italian, The St.
Mary's Church, was used to worship where there was more than ample room. Dec. 8, 1902, on The Feast of the Immaculate Conception, shortly after Mass the fire whistles sounded and upon coming into the street, people noticed smoke issuing from the belfry of the St. Joseph's Church. Five fire departments immediately answered the call, but to no avail, the beautiful church was reduced to ashes in just two hours. The cross fell on a nearby vacant lot and was undamaged. Sorrowfully the Slovenians viewed the ruins but they did not lose faith. Their spiritual needs were attended to in the Italian church which was just vacated by the Croations whose church basement was completed and used for services.